The Archaeology Data Service is currently undertaking a collaborative two-year project with Digital Antiquity to broaden and update their series of Guides to Good Practice. The project will encompass important revisions of the existing six ADS Guides as well as the development of entirely new documents covering areas such as marine scanning, laser scanning, GPS, digital audio and digital video. Previous authors have been asked to revise existing content and new authors, from both Europe and the US, will contribute to the development of the guides into new themes and areas. The project is in collaboration with the Digital Antiquity initiative, a US-based project with the aim of enhancing the preservation of and access to digital records of archaeological investigations. 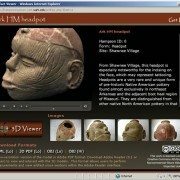 A major aim of the Guides is to provide the basis for archaeological project workflows that will create digital datasets that can be archived and shared effectively by Digital Antiquity’s tDAR repository in the US and by the Archaeology Data Service in the UK. The development of the Guides involves close collaboration with teams in the US at both the University of Arkansas and Arizona State University. Other ADS projects are also planned to feed into the revision and development of the Guides. ADS involvement in the European VENUS project will result in one of the first published guides focussing on marine scanning and photogrammetry. In addition, the incorporation of findings from the ADS Big Data project, together with the revision of the existing guide on aerial photography and remote sensing data, will see a significant contribution to the guides from English Heritage funded projects. The new Guides are under development and only selected sections are publicly available. The new Guides to Good Practice are scheduled to be released in January 2011. 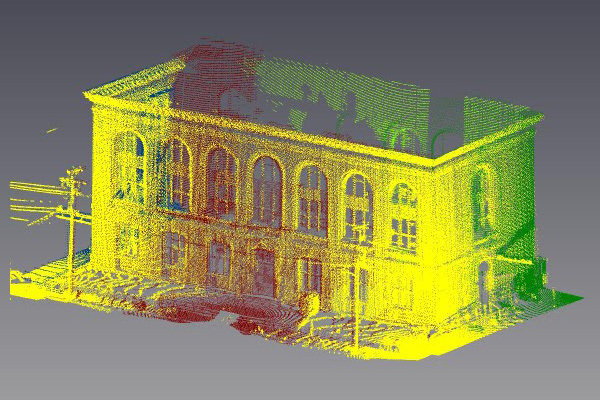 This guide serves as a guide to good practice for the collection and archival of point cloud datasets and the additional derived products produced by terrestrial laser scanners in cultural heritage applications. It is recommended to read this guide in conjunction with Section 7 of the Metric Survey Specifications for Cultural Heritage (Bryan et al 2009) titled ‘Standard Specification for the Collection and Archiving of Terrestrial Laser Scan Data’ published by English Heritage. The Metric Survey Specifications for Cultural Heritage provides an excellent foundation for discussion of key project elements particularly project planning, data collection, and preliminary processing of terrestrial scan data. A lot of these points will be reiterated throughout this document. This guide builds upon the specifications provided by the Metric Survey Specifications for Cultural Heritage by broadening the scope to include such topics as accurate RGB/color acquisition and by also suggesting standards for archiving the derived products of point cloud datasets. Other key resources that were influential in the creation of this guide are 3D Laser Scanning for Heritage (English Heritage 2007) and Theory and Practice on Terrestrial Laser Scanning (3D Risk Mapping 2008). This guide is not a “How To” document that describes methods for collecting and processing scan data but rather a guide to inform individuals of key considerations and metadata elements to document in scanning projects that will allow them to easily archive their heritage datasets. 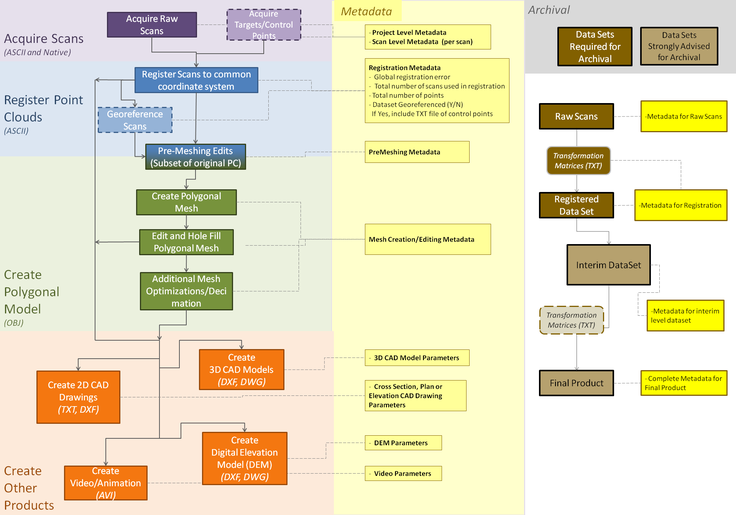 The graphic below shows the key steps of data acquisition and processing, metadata documentation, and data archival for laser scan datasets.These key areas form the basis for discussion for Sections 2 and 3 of this document; Section 1 provides introductory material and Section 4 provides a case study and sample metadata. It is our hope that the metadata elements discussed here will easily integrate into most heritage scanning projects and will promote the ease in archiving and the long term preservation of these valuable datasets. The full draft is available for review at http://guides.archaeologydataservice.ac.uk/g2gp/LaserScan_Toc. Erosion from recent storms uncovered the wreck by Harry R. Feldman Inc. 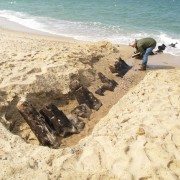 The wreck of the British warship that Paul Revere slipped by on his legendary journey to Lexington in 1775 has resurfaced in the shifting sands of Cape Cod, and federal park officials are seizing the moment by having the wreck “digitally preserved,” using three-dimensional imaging technology. “We know the wreck is going to disappear again under the sand, and it may not resurface again in our lifetimes,” said William P. Burke, the historian at the Cape Cod National Seashore, noting that the last time any part of the HMS Somerset III had been sighted was 37 years ago. The Somerset fought in the American Revolution and had a crew of more than 400. In 1775, Paul Revere slipped through Boston Harbor past the ship before beginning his ride to warn the colonials the British were on the move. In his poem “Paul Revere’s Ride,” Henry Wadsworth Longfellow called it “a phantom ship, with each mast and spar/Across the moon like a prison bar.” The ship sank on Nov. 2, 1778 off the Cape. After erosion from recent storms, about a dozen of the Somerset’s timbers were found poking through the wet sand at low tide in the national seashore in Provincetown. Park officials called on Harry R. Feldman Inc., a land surveying company from Boston, to make the three-dimensional rendering. On Thursday, crews set up survey markers and a laser scanning instrument, said Michael Feldman, the company’s president. The instrument was placed near the timbers, Feldman said. Using the scanner, the surveyors collect millions of data points that are used to create the three-dimensional rendering. “The great thing about this technology is it not only shows a three-dimensional picture or video of what’s there, it also obtains data down to quarter-inch accuracy,” Feldman said. It could take several visits to the site to complete the imaging. But when it’s done, the national seashore will have an animated fly-through of the wreck site — and anyone interested in seeing it won’t have to wait for the timbers to reappear. The imaging will only capture the timbers that are showing. The rest of the wreck, which is buried in sand, might deteriorate if the site were excavated, Burke said. Most of the crew survived when the ship sank, but they didn’t get a warm welcome when they reached the shore, he said. 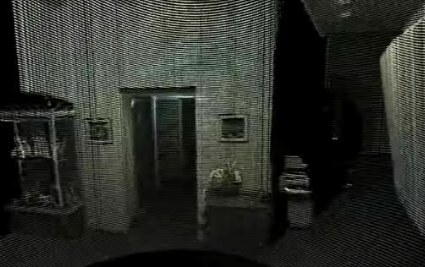 HOUSTON, TX March 18, 2010 Coign Asset Metrics & Technologies (CoignAMT), at the direction of Zoo Film Productions of Hollywood, CA, has helped produce IBM’s first globally released television commercial created entirely from Light Detection and Ranging (LiDAR) 3D point cloud data. CoignAMT used the HDS6100 phase-based laser scanner from Leica Geosystems to create scenes of cars on a freeway, patients in a hospital, electricity grids and much more. The 30-second LiDAR-based commercial is a key part of IBM’s Smarter Planet initiative to portray that data is all around; and that by changing the way the world thinks, companies can maximize the use of data to lower their costs and reduce environmental impact. The Zoo Film Productions crew spent a week in Houston, TX with CoignAMT personnel capturing laser scan data of transmission lines and over 16 blocks of downtown Houston streetscape and surounding buildings. CoignAMT then merged the point cloud data gathered in downtown with 6 square miles of low-altitude helicopter-based LiDAR provided by Aerotec LLC out of Birmingham, AL. Zoo Film Productions crews also created numerous scenes of hospital activities as well as automobiles with and without drivers that CoignAMT scanned individually for use in the commercial. Coign Asset Metrics & Technologies, LLC (CoignAMT) is a HUBZone qualified, SBA certified, small business that provides a full range of asset management life cycle services and specialized technologies, including high definition laser scanning (HDLS). Its mission is to strengthen public and private sector organizations by aligning their assets and operational practices with their strategic initiatives. CoignAMT is headquartered in the Pittsburgh, PA area, with regional offices located in Colorado Springs, CO, and Houston, TX. Clients include federal, state, and local governments, as well as private sector customers in the construction, energy, transportation, manufacturing, and security industries. Zebra Imaging – if you did not have a chance to see them in person, be sure to check out their website because they have developed a truly remarkable product. Zebra Imaging makes digitally-mastered, actively-animated, true-color, full-parallax holographic images. These holographic images are available in full color, or in monochrome (green). Zebra’s holographic images can be scaled to any size, large or small. By tiling together multiple tiles, it is possible to create large city maps, full sized cars, humans, and machinery. Check out a sample video of their technology here. Look for a full post about this technology after the conference. Trimble Indoor Mobile Mapping Solution (TIMMS) – Simply put, this technology is full-dome mobile scanning for interior applications. The technology uses the same IMU-type technology as aerial LiDAR and mobile mapping, but without the GPS. 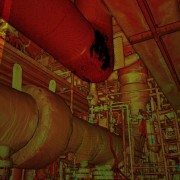 You simply push a cart around a facility to capture detailed, accurate point cloud data without the hassles of registration. Monthly rentals are available or you can purchase the technology. Z+F showed off a new digital camera attachment for the Imager 5006i/Leica HDS-6100. The camera mounts on top of the unit and integrates with the point cloud data through the use of their proprietary software. There are batch capabilities that allow application of the RGB values to be applied to multiple scans at once. These values are appended to the ZFS files without affecting the intensity values. It works flawlessly with the HDS6100, however, a hardware upgrade is needed in order to work with the HDS6000. The cameras can be purchased or leased from Z+F directly. Velodyne Lidar Inc. showed off their real-time 360-degree LiDAR sensor. Velodyne’s sensor was used on the Radiohead House of Cards music video directed by James Frost and Zoo Film Productions for which I recently had the privilege of working with on a new project. 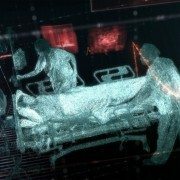 More on that once the project has been released… it is big, real big! In the meantime, check out the results from the Radiohead project. It is guaranteed to amaze you! 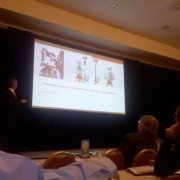 Deke Smith gave a great presentation on the buildingSMART alliance and the National BIM Standard. Join at http://www.buildingsmartalliance.org. Download the Whole Building Design Guide at http://www.wbdg.org. I regret that I was not able to attend the first day, but it has been great to see colleagues I have not seen in a while and catch up on some new technology. Look for more info to be posted tomorrow. Follow us on Twitter for real-time updates from the conference. Spar Point Research LLC has been acquired by Diversified Business Communications, a U.S.-based trade show, publishing and eMedia company headquartered in Portland, Maine. Spar Point Research LLC, a Massachusetts-based company, has organized SPAR conferences in the United States and Japan since 2003. SPAR 2010 will be held Feb. 8-10, 2010 in Houston, Texas, USA. SPAR 2010J will be held April 15-16, 2010 in Kawasaki, Japan. The company also publishes SparView, an electronic newsletter serving more than 12,000 readers from engineering, construction, manufacturing, law enforcement and security planning organizations worldwide. Diversified Business Communications provides information and market access through trade exhibitions, magazine publishing and eMedia products on four continents. Diversified serves a number of industries including seafood, food service, natural and organic products, commercial marine, integrative health care, oil and gas, and business management. Diversified operates divisions in Australia, Canada, Hong Kong, India and the UK. For more information, visit www.divbusiness.com. The MIT Technology Review has unearthed a new laser-based 3D mapping robot that can produce results similar to those obtained from $100,000 systems at about a fifth of the cost. 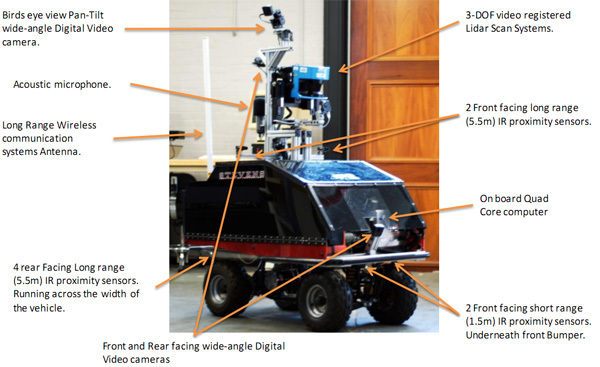 Funded by the US Army, researchers at the Stevens Institute of Technology have now demonstrated the Remotely Operated and Autonomous Mapping System (ROAMS, for short), which employs a mirror-based LIDAR system that bounces a laser off a rapidly rotating mirror and gleans environmental information from how long it takes for each pulse to bounce back. An array of video cameras and IR proximity sensors add to this recon bot‘s sentience, though you’ll still need to be within a mile’s range to operate it. So not quite yet ready for solo missions to Mars, but plenty useful for gathering data on our own planet. You’ll find video and imagery of the results this machine kicks out after the break.